Delane & al. against Delane. The Answer of George Delane and William Longfield, to the Appeal of Dennis Delane, was brought in. D. of Bedford, Pet. referred Judges. His Majesty, being seated on the Throne, with the accustomed Ceremonies; the Prince of Wales (in his Robes) siting in his Place, on His Majesty's Right Hand; the Lords being also in their Robes; commanded the Gentleman Usher of the Black Rod to let the Commons know, "It is His Majesty's Pleasure, that they attend Him immediately, in this House." "1. An Act for punishing Mutiny and Desertion; and for the better Payment of the Army and their Quarters." "2. An Act for continuing an Act passed in the Fifth Year of the Reign of His late Majesty King George the First, intituled, An Act for laying a Duty of Two Pennies Scots, or One Sixth Part of a Penny Sterling, upon every Pint of Ale or Beer that shall be vended or sold within the Town of Dunbar, for improving and preserving the Harbour, and repairing the Town House, and building a School and other Public Buildings there, and for supplying the said Town with fresh Water." "3. An Act to enable Anthony James Esquire, and his Heirs Male, and other Persons therein mentioned, to take and use the Surname of Keck, pursuant to the Will of Anthony Keck Gentleman, deceased." "4. An Act for naturalizing Joseph Pouchon." "5. An Act for naturalizing Nicholas Magens, John Timmerman, and Theodore Davel." Then His Majesty was pleased to retire. Hodie 2a vice lecta est Billa, intituled, "An Act to make perpetual an Act made in the Seventh Year of the Reign of His present Majesty, intituled, An Act to prevent the infamous Practice of Stock-jobbing." Ordered, That the said Bill be read the Third Time To-morrow. 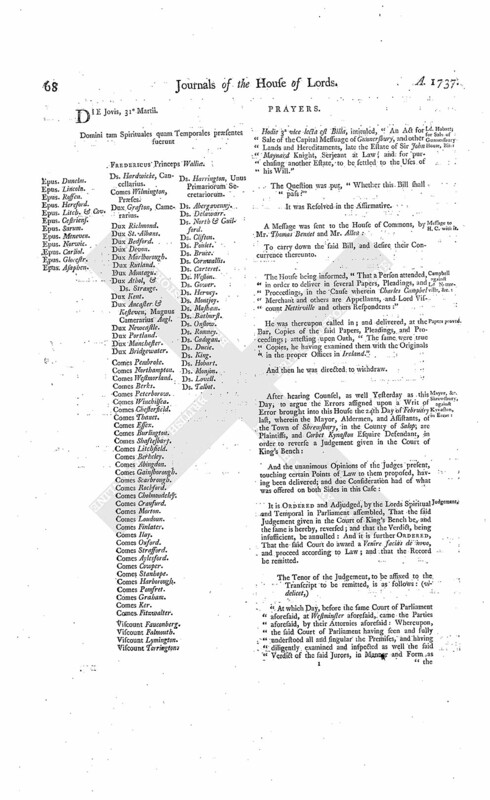 Ordered, That the Judges do attend the Committee of the whole House To-morrow, appointed to take into further Consideration the Speech of the Lords Commissioners appointed by His Majesty for holding this Parliament, made, by His Majesty's Command, to both House, the First Day of February last. And the Lords of Justiciary in Scotland. Then it being moved, "In regard the said Committee have under their Consideration certain Matters relating to the Trial and Proceedings against Captain Porteous, that the Lord Justice Clerk and the Two Senior Lords of the Justiciary in Scotland be ordered to attend this House on this Day Month, in order to give the Committee Information concerning the same:"
Ordered, That the said Lord Justice Clerk and the Two Senior Lords do attend this House accordingly. Hodie 1a vice lecta est Billa, intituled, "An Act for Sale of the Manor and Capital Messuage of Swallowfield, late the Estate of Thomas Pitt Esquire, deceased; and for purchasing another Estate, to be settled to the Uses of his Will." The House being moved, "That a Day may be appointed, for hearing the Cause wherein Edward Edgworth Esquire is Appellant, and Packington Edgworth and others are Respondents:"
It is Ordered, That this House will hear the said Cause, by Counsel, at the Bar, on Friday the first Day of April next. Hodie 1a vice lecta est Billa, intituled, "An Act to vest the Estates of Frederick Trench Esquire, in the Counties of Westmeath and Meath, in the Kingdom of Ireland, in Trustees, to sell the same, for the Purposes therein mentioned." Delane against Delane & al. Ordered, That the Cause wherein Dennis Delane Gentleman is Appellant, and Dennis Delane and others are Respondents, appointed to be heard this Day, be put off till Wednesday next. Des Bouverie to change Name, Bill. Hodie 1a vice lecta est Billa, intituled, "An Act for enabling Sir Jacob Des Bouverie Baronet and John Des Bouverie Esquire, and their respective Issue, and Elizabeth Des Bouverie Sister of the said John, to take and use the Surname of Bouverie, pursuant to the Desire of Jacob Des Bouverie and Sir Christopher Des Bouverie, deceased." 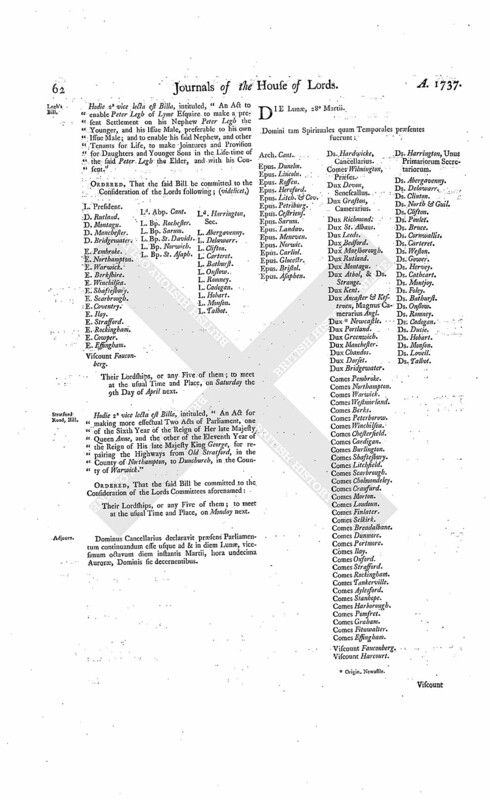 The Earl of Shaftesbury presented to the House (pursuant to their Lordships Order of the 4th Instant) a Bill, intituled, "An Act for dividing and enclosing certain Open and Common Fields, within the Lordship and Parish of Stallingborough, in the County of Lincoln." Hodie 3a vice lecta est Billa, intituled, "An Act to enable Trustees, during the respective Minorities of George Talbot Esquire and his Younger Brothers, to grant Leases of the Estates of the said Infants, in the Counties of Salop, Worcester, Berks, Chester, Stafford, Oxford, and Wilts." Hodie 3a vice lecta est Billa, intituled, "An Act for Sale of a certain Leasehold Estate of Thomas Cooke Esquire, in the County of Glocester; and for settling some Freehold and Copyhold Estates of Inheritance, of greater Value, to the same Uses, in Lieu thereof." Messages to H. C. with the Two preceding Bills. Sir W. Dudley & Ux. Pet. referred to Judges. Nugent & al. to answer Nugent's Appeal peremptorily. 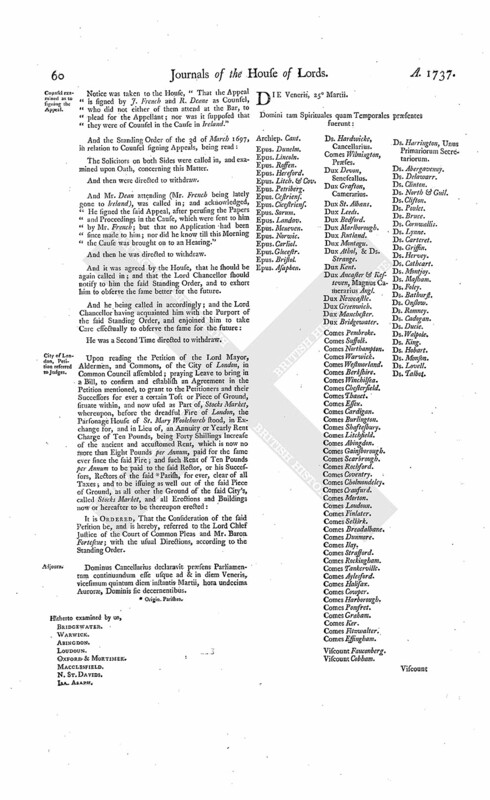 The House was informed, "That His Majesty's Attorney General in the Kingdom of Ireland and Hyacinth Richard Nugent Esquire, called Lord Riverston, had not put in their Answer to the Appeal of William Nugent Esquire and others, though duly served with the Order of this House for that Purpose." Ordered, That the said Respondents do peremptorily put in their Answer or respective Answers to the said Appeal, in a Week. Hodie 3a vice lecta est Billa, intituled, "An Act for naturalizing Godfrey Wichelhausen, John Francis Noppe, and John Stephen Masson." Dominus Cancellarius declaravit præsens Parliamentum continuandum esse usque ad et in diem Martis, vicesimum secundum diem instantis Martii, hora undecima Auroræ, Dominis sic decernentibus. Hodie 2a vice lecta est Billa, intituled, "An Act for Sale of the Manor and Capital Messuage of Swallowfield, late the Estate of Thomas Pitt Esquire, deceased; and for purchasing another Estate, to be settled to the Uses of his Will." Their Lordships, or any Five of them; to meet at the usual Time and Place, on Wednesday the 6th Day of April next; and to adjourn as they please. 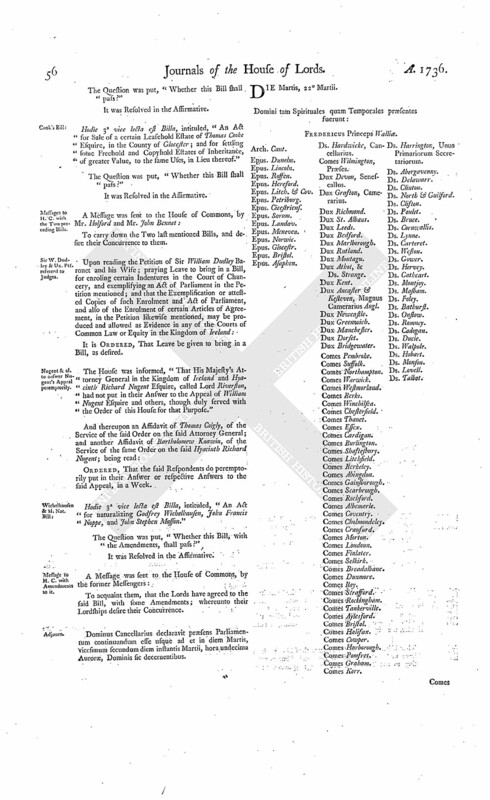 With a Bill, intituled, "An Act for enlarging the Term granted by an Act passed in the Twelfth Year of the Reign of His late Majesty King George the First, intituled, An Act for repairing several Roads therein mentioned, leading into the City of Worcester; and for repairing several other Roads lying contiguous to the same; and for reducing the Toll, or Duties, granted on Sheep and Lambs;" to which they desire the Concurrence of this House. Hodie 2a vice lecta est Billa, intituled, "An Act for enabling Sir Jacob Des Bouverie Baronet and John Des Bouverie Esquire, and their respective Issue, and Elizabeth Des Bouverie, Sister of the said John, to take and use the Surname of Bouverie, pursuant to the Desire of Jacob Des Bouverie Esquire and Sir Christopher Des Bouverie, deceased." Gillingham against Whiskin, in Error. The Lord Chancellor, as Lord Chief Justice of the Court of King's Bench, delivered in a Writ of Error, returnable into this House from the said Court, wherein Roger Gillingham is Plaintiff, and James Whiskin Defendant. Hodie 2a vice lecta est Billa, intituled, "An Act to vest the Estates of Frederick Trench Esquire, in the Counties of Westmeath and Meath, in the Kingdom of Ireland, in Trustees, to sell the same, for the Purposes therein mentioned." Their Lordships, or any Five of them; to meet at the usual Place, on Wednesday the 6th Day of April next; and to adjourn as they please. E. of Berkeley takes his Seat. 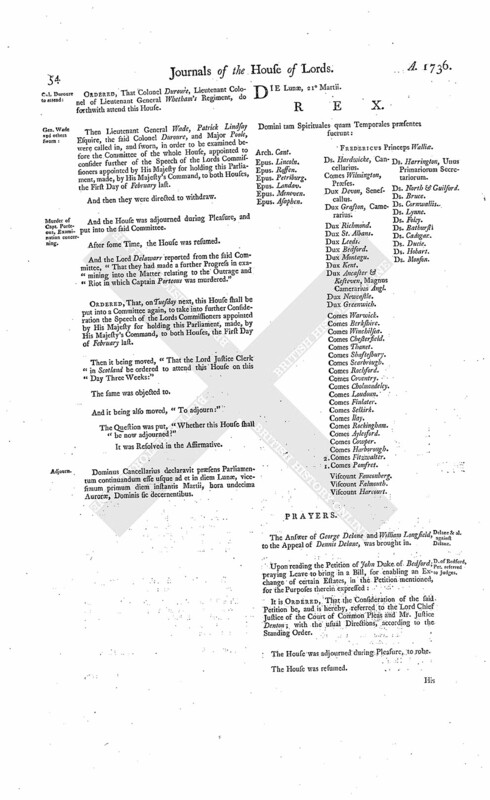 This Day Augustus Earl of Berkeley sat first in Parliament, after the Death of his Father James Earl of Berkeley; his Lordship having, at the Table, first taken the Oaths, and made and subscribed the Declaration, and also taken and subscribed the Oath of Abjuration, pursuant to the Statutes. Hodie 2a vice lecta est Billa, intituled, "An Act for dividing and enclosing certain Open and Common Fields, within the Lordship and Parish of Stallingborough, in the County of Lincoln." Their Lordships, or any Five of them; to meet at the usual Time and Place, on Thursday the 7th Day of April next; and to adjourn as they please. Hodie 3a vice lecta est Billa, intituled, "An Act to make perpetual an Act made in the Seventh Year of the Reign of His present Majesty, intituled, An Act to prevent the infamous Practice of Stock-jobbing." 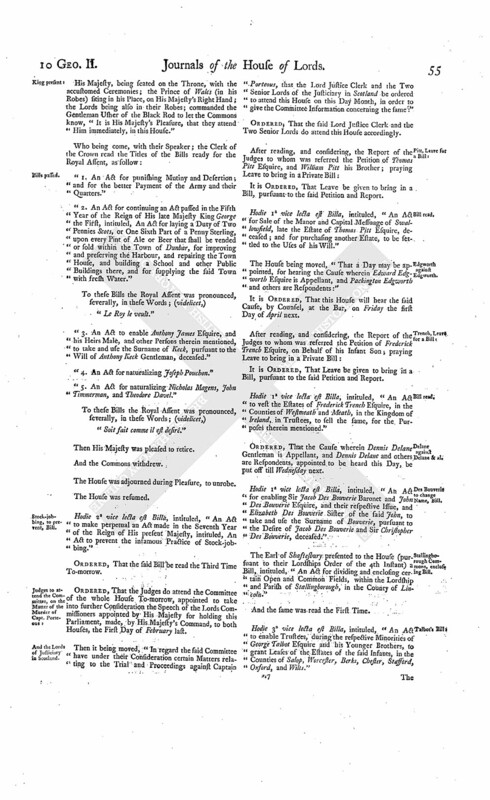 The House (according to Order) was adjourned during Pleasure, and put into a Committee, to take into further Consideration the Speech of the Lords Commissioners appointed by His Majesty for holding this Parliament, made, by His Majesty's Command, to both Houses, the First Day of February last. 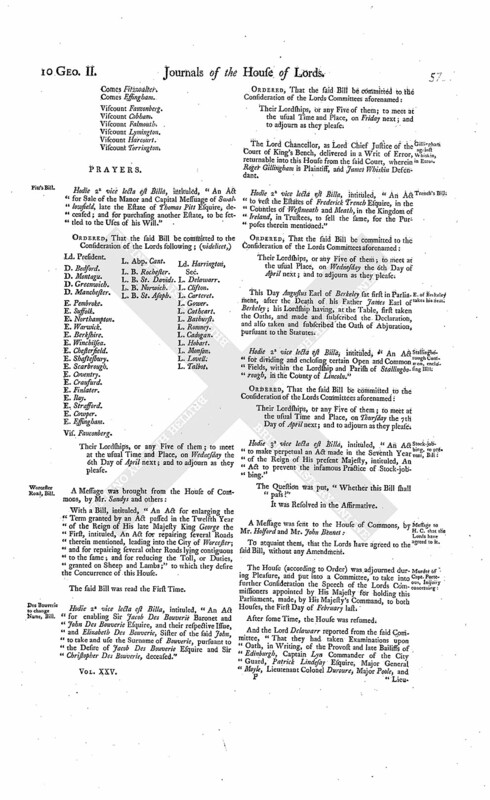 And the Lord Delawarr reported from the said Committee, "That they had taken Examinations upon Oath, in Writing, of the Provost and late Bailiffs of Edinburgh, Captain Lyn Commander of the City Guard, Patrick Lindesay Esquire, Major General Moyle, Lieutenant Colonel Duroure, Major Poole, and Lieutenant General Wade, in relation to the late Outrage and Riot in which Captain Porteous was murdered." Ordered, That the Report of the said Examinations be received on Friday next; and the Lords to be summoned. Ordered, That James Graham Junior Esquire, who was Advocate for Captain Porteous at his Trial, do attend this House on Monday next come Three Weeks. Dominus Cancellarius declaravit præsens Parliamentum continuandum esse usque ad et in diem Mercurii, vicesimum tertium diem instantis Martii, hora undecima Auroræ, Dominis sic decernentibus. Campbell against Coghill & al. Lee against Southwell & al. Hodie 2a vice lecta est Billa, intituled, "An Act for enlarging the Term granted by an Act passed in the Twelfth Year of the Reign of His late Majesty King George the First, intituled, An Act for repairing several Roads therein mentioned, leading into the City of Worcester; and for repairing several other Roads lying contiguous to the same; and for reducing the Toll, or Duties, granted on Sheep and Lambs by the said Act." Vis. Falmouth. L. Bp. Lincoln. L. B. St. Asaph. Ld. Clifton. De Go's & al. against Jones & al. Upon reading the Petition and Appeal of Conrade de Gols Esquire and John Read Gentleman, Assignees of the Estate and Effects of John Ward, late of London Merchant, a Bankrupt; complaining of a Decree of Dismission of the Court of Chancery, of the 4th of December last, made in a Cause wherein the Appellants were Complainants, and Philip Jones, Francis Pyle, Elizabeth Rogers, Ralph Ward, Knox Ward and Elizabeth his Wife, Thomas Nettleton, James Lamborne, and George Wallis, Defendants; and praying, "That the same may be reversed; and that the Appellants may have such other Relief as to the great Wisdom of this House shall seem meet:"
It is Ordered, That the said Defendants may have a Copy of the said Appeal; and they are hereby required to put in their Answer or respective Answers thereunto, in Writing, on or before Wednesday the 6th Day of April next; and that Service of this Order on their respective Clerks in Court be deemed good Service. Trials of Johnson, &c. in the Court of Justiciary, to be brought. Ordered, That an authentic Copy of the Trial of Johnson and Hunt, before the Court of Justiciary in Scotland, in the Year 1711; and also the Trial of Scot and Macpherson, in the Year 1712, before the said Court, and all the Proceedings relating thereto, be laid before this House. And also, that an authentic Copy of the Trial of Thomas Mac Adam and James Long, and all the Proceedings relating thereunto, before the High Court of Admiralty in Scotland, in the Year 1735, and also all the subsequent Proceedings of the Court of Justiciary thereupon, be laid before this House. Counsel (according to Order) were called in, to be heard, in the Cause wherein Dennis Delane Gentleman is Appellant, and Dennis Delane and others are Respondents. Dominus Cancellarius declaravit præsens Parliamentum contiunandum esse usque ad et in diem Jovis, vicesimum quartum diem instantis Martii, hora undecima Auroræ, Dominis sic decernentibus. The Answer of Thomas Lewis, to the Appeal of Rees Griffith, was brought in. The House being informed, "That Mr. Cowdery, from the Exchequer, attended:"
"A State of the National Debt, provided or unprovided for by Parliament, as it stood on the 31st of December 1735, and the 31st of December 1736; together with an Accompt of the Produce of the Sinking Fund in that Year; and to the Payment of what Debts, contracted before the 25th of December 1716, the said Fund hath been applied." And the Title of the said State was read. Campbell & al. against L. Visc. Nettirville. The House being moved, "That a Day may be appointed, for hearing the Cause wherein Charles Campbell Merchant and others are Appellants, and Nicholas Lord Viscount Nettirville and others Respondents:"
The like Motion and Order, for hearing the Cause wherein Rees Griffith is Appellant, and Thomas Lewis Esquire Respondent, the next vacant Day for Causes. 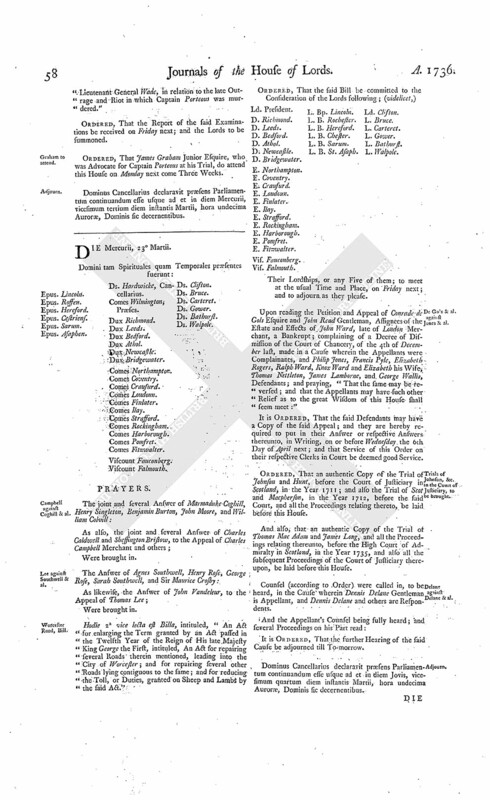 Upon reading the Petition of Thomas Fetherston and others, and also of Richard Ferrall; praying, "In regard their Appeals relate to the same Matter as the Appeal of Roger Ferrall, which is appointed to be heard on the 6th Day of April next, that the Petitioners Appeals may be set down to be heard at the same Time with the Appeal of the said Roger Ferrall:"
It is Ordered, That the Petitioners said Appeals be accordingly heard at the same Time with the said Appeal of Roger Ferrall, as desired. Stratford and Dunchurch Road, Bill. 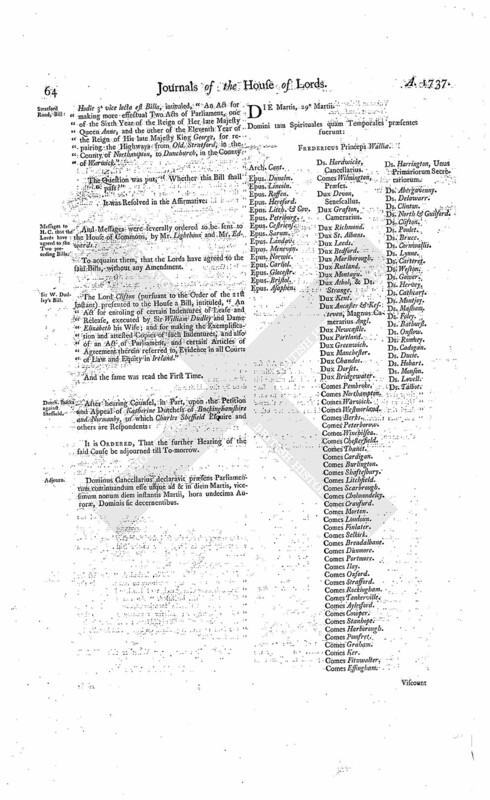 With a Bill, intituled, "An Act for making more effectual Two Acts of Parliament, one of the Sixth Year of the Reign of Her late Majesty Queen Anne, and the other of the Eleventh Year of the Reign of His late Majesty King George, for repairing the Highways from Old Stratford, in the County of Northampton, to Dunchurch, in the County of Warwick;" to which they desire the Concurrence of this House. Hodie 1a vice lecta est Billa, intituled, "An Act to enable Peter Legh, of Lyme, Esquire, to make a present Settlement on his Nephew Peter Legh the Younger, and his Issue Male, preferable to his own Issue Male; and to enable his said Nephew, and other Tenants for Life, to make Jointures and Provision for Daughters and Younger Sons in the Life-time of the said Peter Legh the Elder, and with his Consent." 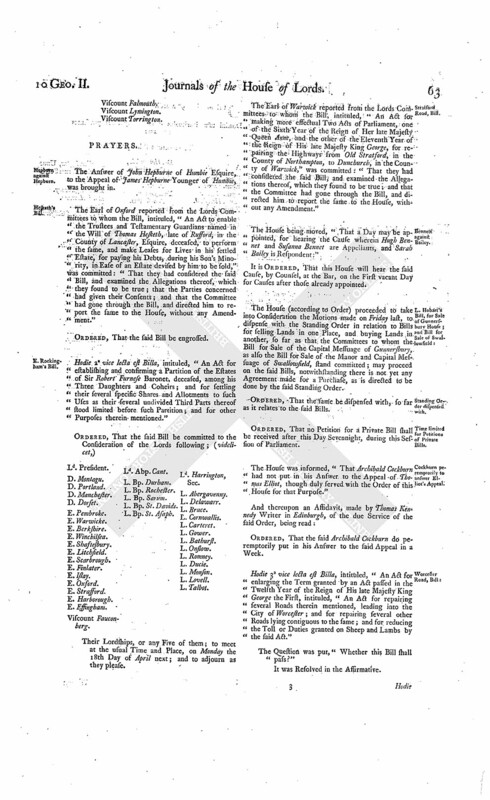 It is Ordered and Adjudged, by the Lords Spiritual and Temporal in Parliament assembled, That the said Petition and Appeal be, and is hereby, dismissed this House; and that the said Order and Decree therein complained of be, and the same is hereby, affirmed: And it is further Ordered, That the said Appellant do pay, or cause to be paid, to the said Respondents, the Sum of One Hundred Pounds, for their Costs in respect of the said Appeal. Counsel examined as to signing the Appeal. Notice was taken to the House, "That the Appeal is signed by J. French and R. Dcane as Counsel, who did not either of them attend at the Bar, to plead for the Appellant; nor was it supposed that they were of Counsel in the Cause in Ireland." The Solicitors on both Sides were called in, and examined upon Oath, concerning this Matter. And then were directed to withdraw. And Mr. Dean attending (Mr. French being lately gone to Ireland), was called in; and acknowledged, "He signed the said Appeal, after perusing the Papers and Proceedings in the Cause, which were sent to him by Mr. French; but that no Application had been since made to him; nor did he know till this Morning the Cause was brought on to an Hearing." And it was agreed by the House, that he should be again called in; and that the Lord Chancellor should notify to him the said Standing Order, and to exhort him to observe the same better for the future. He was a Second Time directed to withdraw. City of London, Petition referred to Judges. It is Ordered, That the Consideration of the said Petition be, and is hereby, referred to the Lord Chief Justice of the Court of Common Pleas and Mr. Baron Fortescue; with the usual Directions, according to the Standing Order. Dominus Cancellarius declaravit præsens Parliamentum continuandum esse usque ad & in diem Veneris, vicesimum quintum diem instantis Martii, hora undecima Auroræ, Dominis sic decernentibus. The Answer of Andrew Wauchope of Neddrie Esquire and others, to the Appeal of Gilbert Wauchope Doctor of Medicine and others, was brought in. The Lord Delawarr reported from the Lords Committees to whom the Bill, intituled, "An Act for enlarging the Term granted by an Act passed in the Twelfth Year of the Reign of His late Majesty King George the First, intituled, "An Act for repairing several Roads therein mentioned, leading into the City of Worcester;" and for repairing several other Roads lying contiguous to the same; and for reducing the Toll or Duties granted on Sheep and Lambs by the said Act," was committed: "That they had considered the said Bill, and examined the Allegations thereof, which they found to be true; and that the Committee had gone through the Bill, and directed him to report the same to the House, without any Amendment." Desbouverie to change Name, Bill. His Lordship made the like Report from the Committee to whom the Bill, intituled, "An Act for enabling Sir Jacob Des Bouverie Baronet and John Des Bouverie Esquire, and their respective Issue, and Elizabeth Des Bouverie, Sister of the said John, to take and use the Surname of Bouverie, pursuant to the Desire of Jacob Des Bouverie Esquire and Sir Christopher Des Bouverie, deceased," was committed. Hodie 1a vice lecta est Billa, intituled, "An Act for establishing and confirming a Partition of the Estates of Sir Robert Furnese Baronet, deceased, among his Three Daughters and Coheirs; and for settling their several specific Shares and Allotments to such Uses as their several undivided Third Parts thereof stood limited before such Partition; and for other Purposes therein mentioned." L. Hobart's Bill, for Sale of Gunnersbury House. 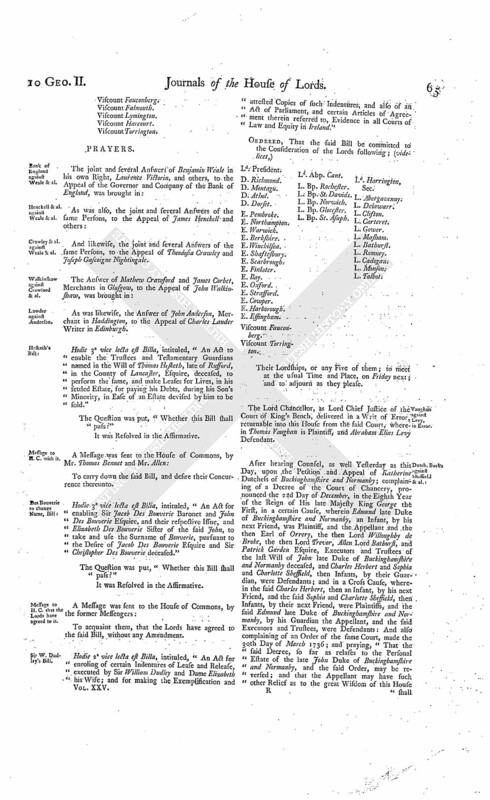 Moved, "That the Standing Order, in relation to Bills for selling Lands in one Place, and buying Lands in another, may be so far dispensed with, as that the Committee to whom the Bill for Sale of the Capital Messuage of Gunnersbury, and other Purposes, stands committed, may proceed on the said Bill, notwithstanding no Agreement is yet made for the Purchase of another Estate, in which the Money that may arise from the said Sale is to be invested." Ordered, That this House will, on Monday next, take the said Motion into Consideration; and the Lords to be summoned. Swallowfield Manor, Sale of, Bill. 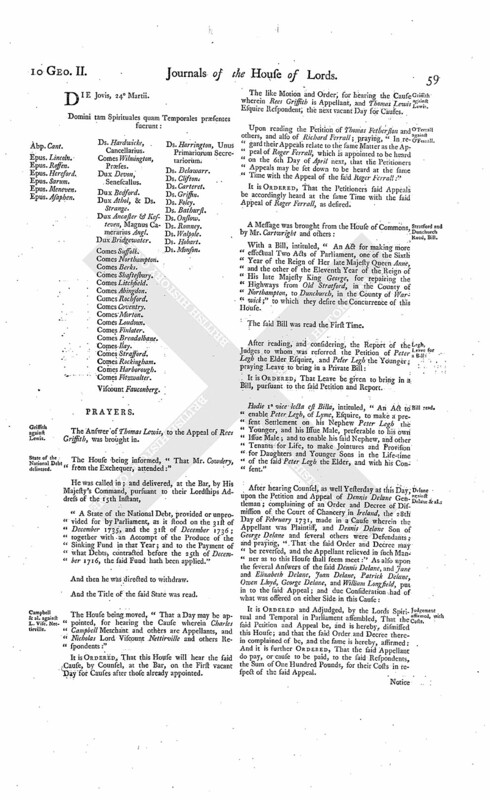 The like Motion and Order, in relation to the Committee on the Bill for Sale of the Manor and Capital Messuage of Swallowfield. The Lord Delawarr (according to Order) reported from the Committee of the whole House, appointed to consider further of the Speech of the Lords Commissioners appointed by His Majesty for holding this Parliament, made, by His Majesty's Command, to both Houses, the First Day of February last: "That the Committee had considered the Matter to them referred; and had taken Examinations upon Oath, in Writing, of Alexander Wilson the Provost, Thomas Crokart, James Colhoun, Alexander Blackwood, and Gawen Hamilton, the Bailiffs of Edinburgh in the Year 1736, John Lyn Captain-Lieutenant of the City Guard, Patrick Lindesey Esquire, Major General Moyle, Colonel Duroure, Major Poole, and Lieutenant General Wade, in relation to the late Outrage and Riot in Scotland, wherein Captain Porteous was murdered." Ordered, That the same be taken into Consideration on Thursday next; and the Lords to be summoned. Ordered, That the authentic Extract of the Proceedings in the Trial of Captain John Porteous, laid before this House the 3d Day of this Instant March, be printed. Advocates at the Trial to attend. Ordered, That Alexander Lockart and Henry Home, who were Advocates for Captain Porteous at his Trial, do attend this House on Monday next come Three Weeks. Complaint was made to the House, and Oath made at the Bar by several Witnesses, "That Thomas Buckby, of Great Bowden, in the County of Leicester, had spoken contemptuous and defamatory Words of the Lord Griffin, in Breach of the Privilege of this House:"
Buckby attached, for contemptuous Words. It is Ordered, That the Serjeant at Arms attending this House, his Deputy or Deputies, do forthwith attach the Body of the said Thomas Buckby, and keep him in safe Custody until further Order of this House; and this shall be a sufficient Warrant on that Behalf. To Francis Jephson Esquire, Serjeant at Arms attending this House, his Deputy or Deputies, and every of them; and all Sheriffs, Mayors, Bailiffs, Constables, and other His Majesty's Officers and loving Subjects, are to be aiding and assisting in the Execution hereof. The House being moved, "That a Day may be appointed, for hearing the Cause wherein Gilbert Wauchope and others are Appellants, and Andrew Wauchope and James Wauchope Esquires Respondents:"
The like Motion and Order, for hearing the Cause wherein Richard Ryland is Appellant, and James Roch Green and others are Respondents, on the next vacant Day for Causes. Hodie 2a vice lecta est Billa, intituled, "An Act to enable Peter Legh of Lyme Esquire to make a present Settlement on his Nephew Peter Legh the Younger, and his Issue Male, preferable to his own Issue Male; and to enable his said Nephew, and other Tenants for Life, to make Jointures and Provision for Daughters and Younger Sons in the Life-time of the said Peter Legh the Elder, and with his Consent." L. Bp. St. Asaph. Ld. Harrington, Sec. Their Lordships, or any Five of them; to meet at the usual Time and Place, on Saturday the 9th Day of April next. Hodie 2a vice lecta est Billa, intituled, "An Act for making more effectual Two Acts of Parliament, one of the Sixth Year of the Reign of Her late Majesty Queen Anne, and the other of the Eleventh Year of the Reign of His late Majesty King George, for repairing the Highways from Old Stratford, in the County of Northampton, to Dunchurch, in the County of Warwick." Their Lordships, or any Five of them; to meet at the usual Time and Place, on Monday next. Dominus Cancellarius declaravit præsens Parliamentum continuandum esse usque ad & in diem Lunæ, vicesimum octavum diem instantis Martii, hora undecima Auroræ, Dominis sic decernentibus. The Answer of John Hepburne of Humbie Esquire, to the Appeal of James Hepburne Younger of Humbie, was brought in. The Earl of Oxford reported from the Lords Committees to whom the Bill, intituled, "An Act to enable the Trustees and Testamentary Guardians named in the Will of Thomas Hesketh, late of Rufford, in the County of Lancaster, Esquire, deceased, to perform the same, and make Leases for Lives in his settled Estate, for paying his Debts, during his Son's Minority, in Ease of an Estate devised by him to be sold," was committed: "That they had considered the said Bill, and examined the Allegations thereof, which they found to be true; that the Parties concerned had given their Consents; and that the Committee had gone through the Bill, and directed him to report the same to the House, without any Amendment." Hodie 2a vice lecta est Billa, intituled, "An Act for establishing and confirming a Partition of the Estates of Sir Robert Furnese Baronet, deceased, among his Three Daughters and Coheirs; and for settling their several specific Shares and Allotments to such Uses as their several undivided Third Parts thereof stood limited before such Partition; and for other Purposes therein mentioned." Their Lordships, or any Five of them; to meet at the usual Time and Place, on Monday the 18th Day of April next; and to adjourn as they please. The Earl of Warwick reported from the Lords Committees to whom the Bill, intituled, "An Act for making more effectual Two Acts of Parliament, one of the Sixth Year of the Reign of Her late Majesty Queen Anne, and the other of the Eleventh Year of the Reign of His late Majesty King George, for repairing the Highways from Old Stratford, in the County of Northampton, to Dunchurch, in the County of Warwick," was committed: "That they had considered the said Bill, and examined the Allegations thereof, which they found to be true; and that the Committee had gone through the Bill, and directed him to report the same to the House, without any Amendment." The House being moved, "That a Day may be appointed, for hearing the Cause wherein Hugh Bennet and Susanna Bennet are Appellants, and Sarah Bailey is Respondent:"
The House (according to Order) proceeded to take into Consideration the Motions made on Friday last, to dispense with the Standing Order in relation to Bills for selling Lands in one Place, and buying Lands in another, so far as that the Committees to whom the Bill for Sale of the Capital Messuage of Gunnersbury, as also the Bill for Sale of the Manor and Capital Messuage of Swallowfield, stand committed; may proceed on the said Bills, notwithstanding there is not yet any Agreement made for a Purchase, as is directed to be done by the said Standing Order. Ordered, That the same be dispensed with, so far as it relates to the said Bills. Time limited for Petitions of Private Bills. Ordered, That no Petition for a Private Bill shall be received after this Day Sevennight, during this Session of Parliament. Cockburn peremptorily to answer Elliot's Appeal. The House was informed, "That Archibald Cockburn had not put in his Answer to the Appeal of Thomas Elliot, though duly served with the Order of this House for that Purpose." Ordered, That the said Archibald Cockburn do peremptorily put in his Answer to the said Appeal in a Week. Hodie 3a vice lecta est Billa, intituled, "An Act for enlarging the Term granted by an Act passed in the Twelfth Year of the Reign of His late Majesty King George the First, intituled, "An Act for repairing several Roads therein mentioned, leading into the City of Worcester; and for repairing several other Roads lying contiguous to the same; and for reducing the Toll or Duties granted on Sheep and Lambs by the said Act." Hodie 3a vice lecta est Billa, intituled, "An Act for making more effectual Two Acts of Parliament, one of the Sixth Year of the Reign of Her late Majesty Queen Anne, and the other of the Eleventh Year of the Reign of His late Majesty King George, for repairing the Highways from Old Stratford, in the County of Northampton, to Dunchurch, in the County of Warwick." 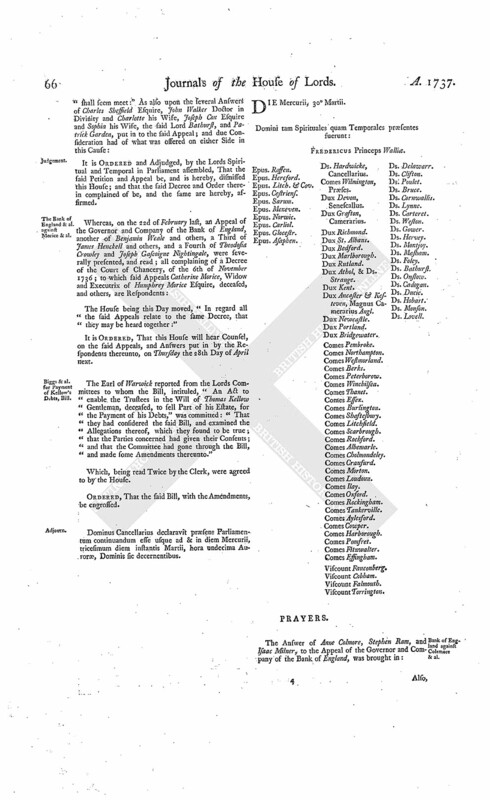 The Lord Clifton (pursuant to the Order of the 21st Instant) presented to the House a Bill, intituled, "An Act for enroling of certain Indentures of Lease and Release, executed by Sir William Dudley and Dame Elizabeth his Wife; and for making the Exemplification and attested Copies of such Indentures, and also of an Act of Parliament, and certain Articles of Agreement therein referred to Evidence in all Courts of Law and Equity in Ireland." Dominus Cancellarius declaravit præsens Parliamentum continuandum esse usque ad & in diem Martis, vicesimum nonum diem instantis Martii, hora undecima Auroræ, Dominis sic decernentibus. Bank of England against Weale & al. Henckell & al. against Weale & al. Crawley & al. against Weale & al. And likewise, the joint and several Answers of the same Persons, to the Appeal of Theodosia Crawley and Joseph Gascoigne Nightingale. Walkinshaw against Crawford & al. As was likewise, the Answer of John Anderson, Merchant in Haddington, to the Appeal of Charles Lauder Writer in Edinburgh. Hodie 3a vice lecta est Billa, intituled, "An Act to enable the Trustees and Testamentary Guardians named in the Will of Thomas Hesketh, late of Rufford, in the County of Lancaster, Esquire, deceased, to perform the same, and make Leases for Lives, in his settled Estate, for paying his Debts, during his Son's Minority, in Ease of an Estate devised by him to be sold." Hodie 3a vice lecta est Billa, intituled, "An Act for enabling Sir Jacob Des Bouverie Baronet and John Des Bouverie Esquire, and their respective Issue, and Elizabeth Des Bouverie Sister of the said John, to take and use the Surname of Bouverie, pursuant to the Desire of Jacob Des Bouverie Esquire and Sir Christopher Des Bouverie deceased." Hodie 2a vice lecta est Billa, intituled, "An Act for enroling of certain Indentures of Lease and Release, executed by Sir William Dudley and Dame Elizabeth his Wife; and for making the Exemplification and attested Copies of such Indentures, and also of an Act of Parliament, and certain Articles of Agreement therein referred to, Evidence in all Courts of Law and Equity in Ireland." Vaughan against Levy in Error. The Lord Chancellor, as Lord Chief Justice of the Court of King's Bench, delivered in a Writ of Error, returnable into this House from the said Court, wherein Thomas Vaughan is Plaintiff, and Abraham Elias Levy Defendant. It is Ordered and Adjudged, by the Lords Spiritual and Temporal in Parliament assembled, That the said Petition and Appeal be, and is hereby, dismissed this House; and that the said Decree and Order therein complained of be, and the same are hereby, affirmed. The Bank of England & al. against Morice & al. The House being this Day moved, "In regard all the said Appeals relate to the same Decree, that they may be heard together:"
It is Ordered, That this House will hear Counsel, on the said Appeals, and Answers put in by the Respondents thereunto, on Thursday the 28th Day of April next. Biggs & al. for Payment of Kellow's Debts, Bill. The Earl of Warwick reported from the Lords Committees to whom the Bill, intituled, "An Act to enable the Trustees in the Will of Thomas Kellow Gentleman, deceased, to sell Part of his Estate, for the Payment of his Debts," was committed: "That they had considered the said Bill, and examined the Allegations thereof, which they found to be true; that the Parties concerned had given their Consents; and that the Committee had gone through the Bill, and made some Amendments thereunto." Dominus Cancellarius declaravit præsens Parliamentum continuandum esse usque ad & in diem Mercurii, tricesimum diem instantis Martii, hora undecima Auroræ, Dominis sic decernentibus. Bank of England against Colemore & al. Weale & al. against Colmore. Henckell & al. against Colmore. And also, her Answer to the Appeal of Theodosia Crawley and Joseph Gascoigne Nightingale. Walkinshaw against L. Advocate for Scotland. The Answer of Duncan Forbes Esquire, His Majesty's Advocate for Scotland, on Behalf of His Majesty, to the Appeal of John Walkinshaw Merchant in Glasgow, was brought in. As was also, the joint and several Answer of Robert Jocelyn Esquire, His Majesty's Attorney General in Ireland, and of Hyacinth Richard Nugent Esquire, commonly called Lord Riverstone, to the Appeal of William Nugent Esquire and others. L. Hobart, for Sale of Gunnersbury House, Bill. The Lord Lovell reported from the Lords Committees to whom the Bill, intituled, "An Act for Sale of the Capital Messuage of Gunnersbury, and other Lands and Hereditaments, late the Estate of Sir John Maynard Knight, Serjeant at Law; and for purchasing another Estate, to be settled to the Uses of his Will," was committed: "That they had considered the said Bill, and examined the Allegations thereof, which they found to be true; that the Parties concerned had given their Consents; and that the Committee had gone through the Bill, and made some Amendments thereunto." Walkinshaw against Crawfurd & al. 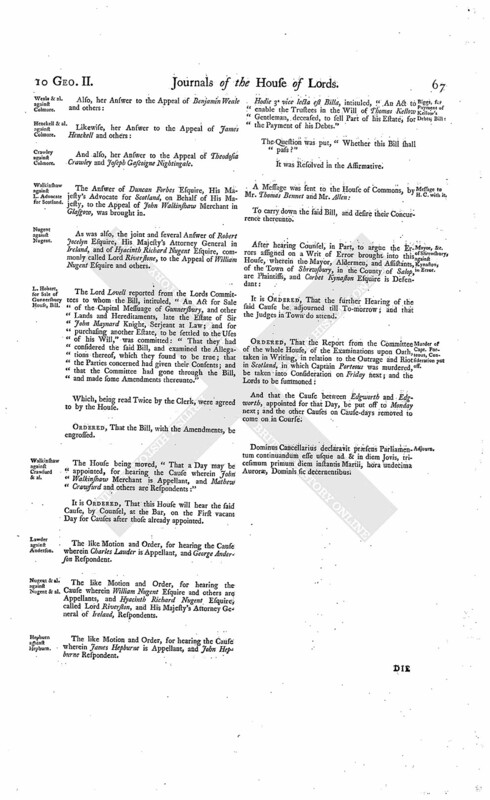 The House being moved, "That a Day may be appointed, for hearing the Cause wherein John Walkinshaw Merchant is Appellant, and Mathew Crawfurd and others are Respondents:"
The like Motion and Order, for hearing the Cause wherein Charles Lauder is Appellant, and George Anderson Respondent. Nugent & al. against Nugent & al. 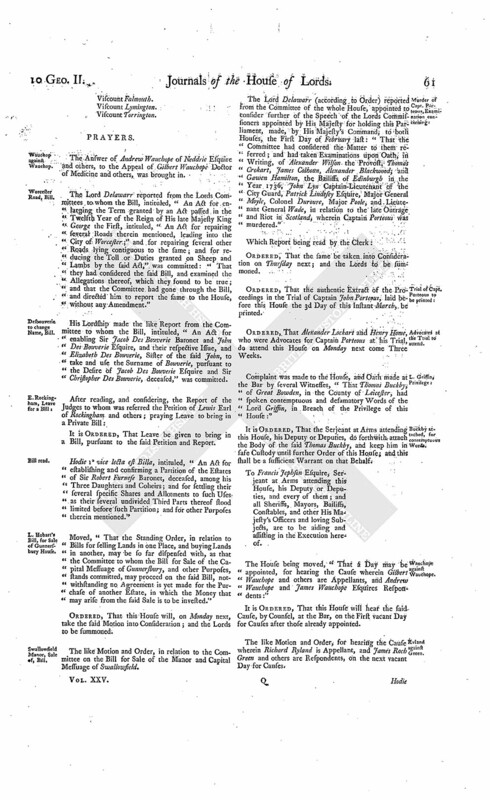 The like Motion and Order, for hearing the Cause wherein William Nugent Esquire and others are Appellants, and Hyacinth Richard Nugent Esquire, called Lord Riverston, and His Majesty's Attorney General of Ireland, Respondents. The like Motion and Order, for hearing the Cause wherein James Hepburne is Appellant, and John Hepburne Respondent. Hodie 3a vice lecta est Billa, intituled, "An Act to enable the Trustees in the Will of Thomas Kellow Gentleman, deceased, to sell Part of his Estate, for the Payment of his Debts." Mayor, &c. of Shrewsbury, against Kynaston, in Error. It is Ordered, That the further Hearing of the said Cause be adjourned till To-morrow; and that the Judges in Town do attend. Murder of Capt. Porteous, Consideration put off. And that the Cause between Edgworth and Edgworth, appointed for that Day, be put off to Monday next; and the other Causes on Cause-days removed to come on in Course. Dominus Cancellarius declaravit præsens Parliamentum continuandum esse usque ad & in diem Jovis, tricesimum primum diem instantis Martii, hora undecima Auroræ, Dominis sic decernentibus. Hodie 3a vice lecta est Billa, intituled, "An Act for Sale of the Capital Messuage of Gunnersbury, and other Lands and Hereditaments, late the Estate of Sir John Maynard Knight, Serjeant at Law; and for purchasing another Estate, to be settled to the Uses of his Will." 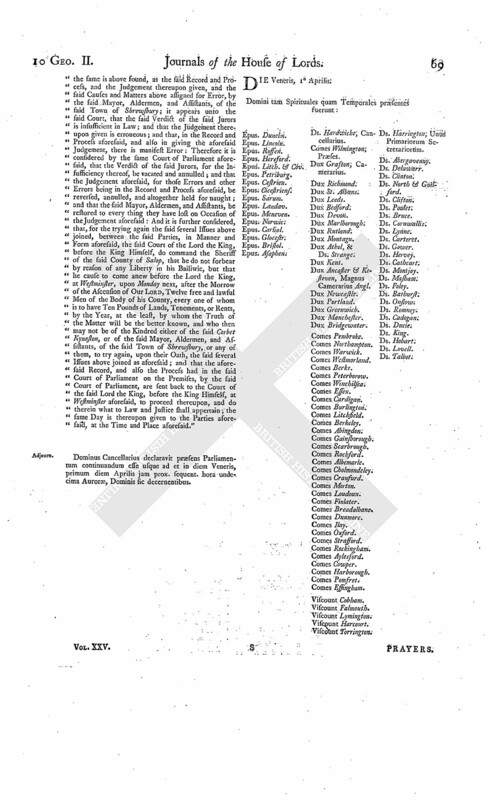 The House being informed, "That a Person attended, in order to deliver in several Papers, Pleadings, and Proceedings, in the Cause wherein Charles Campbel Merchant and others are Appellants, and Lord Viscount Nettirville and others Respondents:"
He was thereupon called in; and delivered, at the Bar, Copies of the said Papers, Pleadings, and Proceedings; attesting upon Oath, "The same were true Copies, he having examined them with the Originals in the proper Offices in Ireland." It is Ordered and Adjudged, by the Lords Spiritual and Temporal in Parliament assembled, That the said Judgement given in the Court of King's Bench be, and the same is hereby, reversed; and that the Verdict, being insufficient, be annulled: And it is further Ordered, That the said Court do award a Venire facias de novo, and proceed according to Law; and that the Record be remitted. "At which Day, before the same Court of Parliament aforesaid, at Westminster aforesaid, came the Parties aforesaid, by their Attornies aforesaid: Whereupon, the said Court of Parliament having seen and fully understood all and singular the Premises, and having diligently examined and inspected as well the said Verdict of the said Jurors, in Manner and Form as the same is above found, as the said Record and Process, and the Judgement thereupon given, and the said Causes and Matters above assigned for Error, by the said Mayor, Aldermen, and Assistants, of the said Town of Shrewsbury; it appears unto the said Court, that the said Verdict of the said Jurors is insufficient in Law; and that the Judgement thereupon given is erroneous; and that, in the Record and Process aforesaid, and also in giving the aforesaid Judgement, there is manifest Error: Therefore it is considered by the same Court of Parliament aforesaid, that the Verdict of the said Jurors, for the Insufficiency thereof, be vacated and annulled; and that the Judgement aforesaid, for those Errors and other Errors being in the Record and Process aforesaid, be reversed, annulled, and altogether held for naught; and that the said Mayor, Aldermen, and Assistants, be restored to every thing they have lost on Occasion of the Judgement aforesaid: And it is further considered, that, for the trying again the said several Issues above joined, between the said Parties, in Manner and Form aforesaid, the said Court of the Lord the King, before the King Himself, do command the Sheriff of the said County of Salop, that he do not forbear by reason of any Liberty in his Bailiwic, but that he cause to come anew before the Lord the King, at Westminster, upon Monday next, after the Morrow of the Ascension of Our Lord, Twelve free and lawful Men of the Body of his County, every one of whom is to have Ten Pounds of Lands, Tenements, or Rents, by the Year, at the least, by whom the Truth of the Matter will be the better known, and who then may not be of the Kindred either of the said Corbet Kynaston, or of the said Mayor, Aldermen, and Assistants, of the said Town of Shrewsbury, or any of them, to try again, upon their Oath, the said several Issues above joined as aforesaid; and that the aforesaid Record, and also the Process had in the said Court of Parliament on the Premises, by the said Court of Parliament, are sent back to the Court of the said Lord the King, before the King Himself, at Westminster aforesaid, to proceed thereupon, and do therein what to Law and Justice shall appertain; the same Day is thereupon given to the Parties aforesaid, at the Time and Place aforesaid." Dominus Cancellarius declaravit præsens Parliamentum continuandum esse usque ad et in diem Veneris, primum diem Aprilis jam prox. sequent. hora undecima Auroræ, Dominis sic decernentibus.